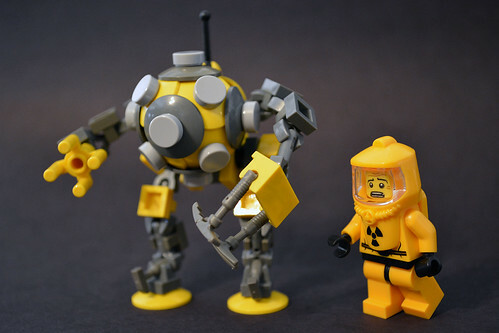 Yellow Radiation Bot. 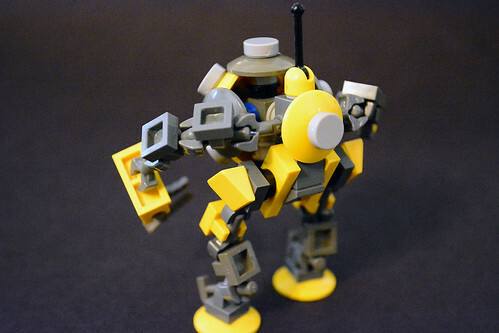 This little mech goes where no man can go. 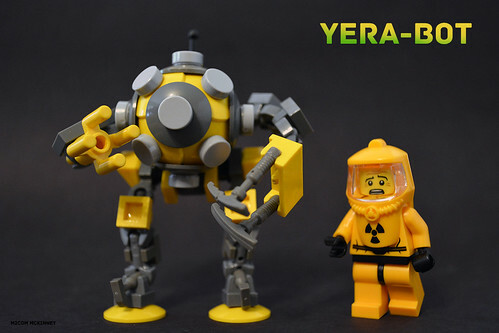 With its mechanical innards, it can withstand any type of anti-human hazard! The "head" module was inspired by this awesome guy on Flickr. PS: Well, I'm back guys! After some time of looking for some inspiration, I think I will be back to posting a little bit more regularly so expect some more later! Appreciate all your comments! Didn't realize that I made MOTD, thanks MOCPages! Super awesome bot. Congrats on MOTD! Awesome job, super creative use of pieces! I just now realized that you show how to build it in one of your pictures. OK, wow, How in the world did you make that body?! this is a great little droid, excellent design and parts usage on the front eyeball section! keep it up! That's awesome! Very well made! Great looking bot! 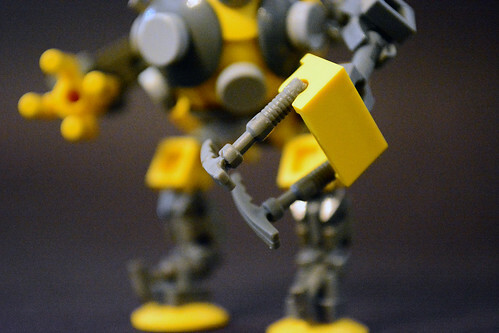 The yellow looks awesome--not a color you really see in a lot of mechs. That is some awesome shaping! Very cool and elegant design, although it looks incredibly fragile. awesome! very nice piece usage. WOW! Great construction for the head/body. I need to try something with layered parabola. Thanks for the great idea. Glad to see more creations! So many great details to explore and 'other use' of pieces to admire --- and copy. Love it. Hey great build! And thanks for your recent comment on my creation! That dome is so great! Cool bot. The head and legs are great. I can't believe the shape of the head. 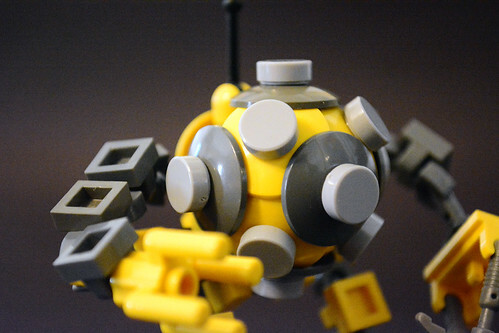 The sphere body is really well done ! Really cool. Love the spherical body. A lot of thought and effort went into creating that. 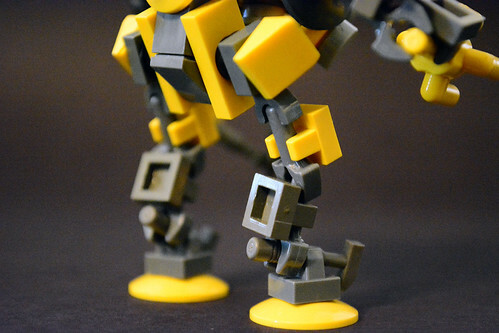 I also like the greebled legs. A win. Nice work. A super robot. Nice to see one that doesn't bristle with weapons too. The spherical body is a brilliant use of those radar dishes. Awesome! Great greebles, and I really like the use of the dish pieces. Awesome! the head piece is the best! Very creative design. I like it a lot. Very cool and an excellent design. The 1x1 round tiles on the "head" give a great look to this. Nice MOC! The form fits the function very well. I like the techniques that you use, too. The "hands" are clever as well. Quoting SuperSpy X A cool little bot! I think the ball structure could be adapted into a very good underwater mine. A cool little bot! I think the ball structure could be adapted into a very good underwater mine.